I love that this pan is non-stick, but it still needs a light coating of baking spray before you press the cookie dough in. Now, an easy mistake to make is overfilling the pan. The cavities should be filled only 2/3 full. This ends up being about 1 1/2 tablespoons of dough per cavity. Use this amount and you'll have no overflow or oddly-shaped bones. I glazed the bones with a simple confectioner's glaze, which is SO easy to make. I wanted them to be bright white, so I added white food color to make the glaze opaque. After the glaze dries (which will take a couple of hours) you can dust the cookies with unsweet cocoa powder. This gives them a spooky, aged look. Eeeeew! I love it. The sugar cookie recipe came with the pan, and it's a new favorite. It's buttery and chewy - what I'd call bakery quality. It's not sticky to handle so it shapes easily. I hope you'll try it, if not with this pan, then just as simple cut-outs! 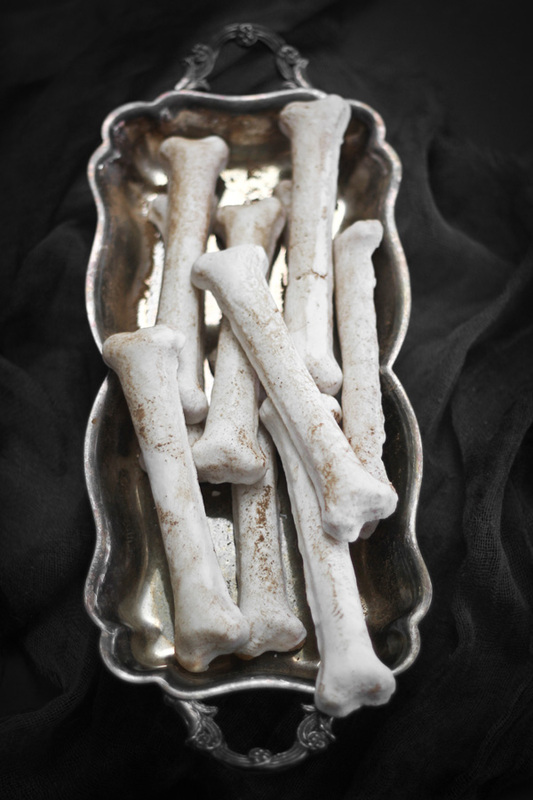 You’ll need Wilton’s Bone Cookie Pan to make this recipe. You can find it online, or in the baking aisle with the seasonal merchandise. Preheat oven to 350°F. Lightly spray pan cavities with baking spray. In a large bowl, beat butter and sugar with an electric mixer at medium speed until well blended. Beat in egg and extracts; mix well. Combine flour and salt; add to butter mixture. Beat until well blended. Press dough into cavities, filling it 2/3 full (this is about 1 1/2 level tablespoons of dough). Bake 10 to 12 minutes or until light brown around the edges. Cool in the pan for 10 minutes. Turn pan over, lightly tap pan to remove the cookies. Cool completely on a wire rack. Run the pan under cold water for 10 seconds to cool it down. Wipe it dry and repeat filling/baking process. Combine the confectioner’s sugar, White-White Icing Color, and vanilla in a large bowl. Add 1 tablespoon of milk and stir slowly with a wire whisk. Gradually add in tablespoons of milk as needed until the mixture loosens and the glaze falls in a thick ribbon from a spoon. The mixture should not be so thick that it sits on top of the cookie and doesn’t run off the edges. Add additional milk if you get this result with the first cookie. Place a cooling rack over a large baking pan with a lip. Place the cookies, well spaced, on the rack and spoon glaze over each cookie. Allow the cookies to dry, about 2 to 3 hours. Transfer the dry cookies to a piece of waxed paper and dust them, using a dry pastry brush, with unsweet cocoa. Keep cookies in a container that seals air-tight. *This post is sponsored by Wilton, however, I only recommend products or services I use personally and believe will add value to the efforts of my readers. Never thought I'd be craving dusty bones cookies, but BAM! I am. Love these! Great thinking with the white food colour...gonna keep that in mind. these are so fun and fantastic! 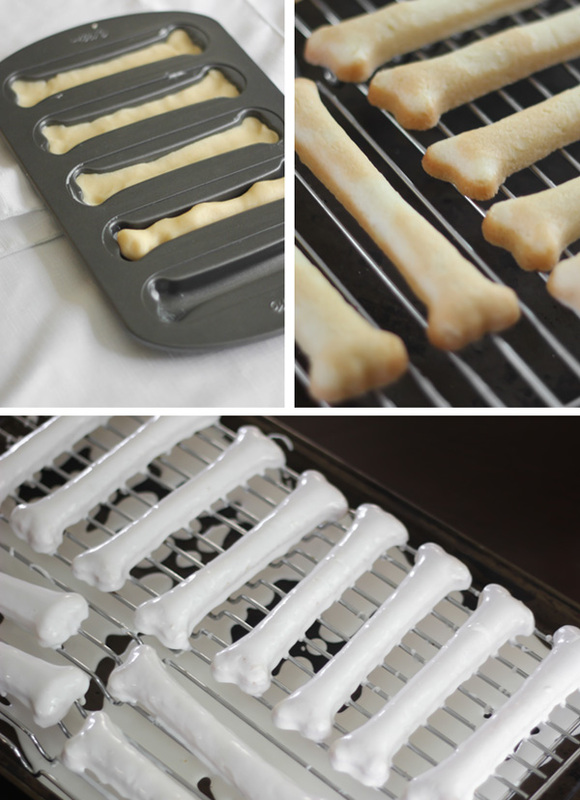 I love that bone tray, its too cute. These are amazingly lifelike looking!! Well I guess they're bones, so they could never be 'lifelike', haha but you get what I mean! 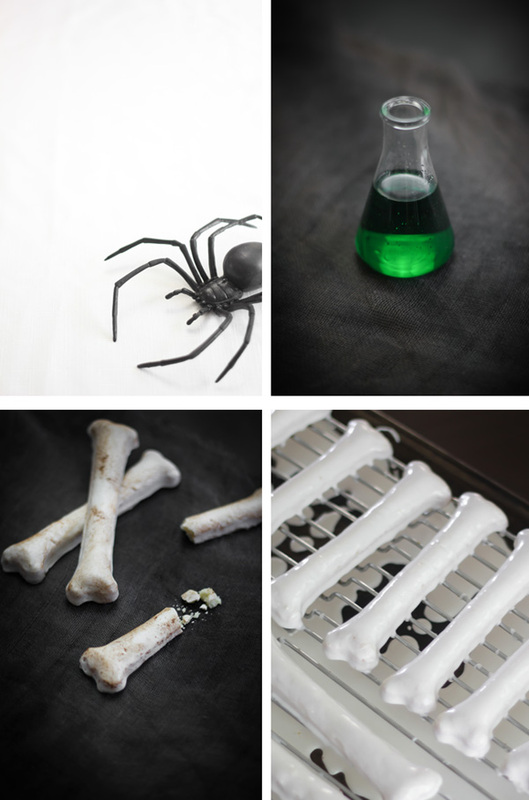 What a creative halloween cooking idea! These are so awesome! 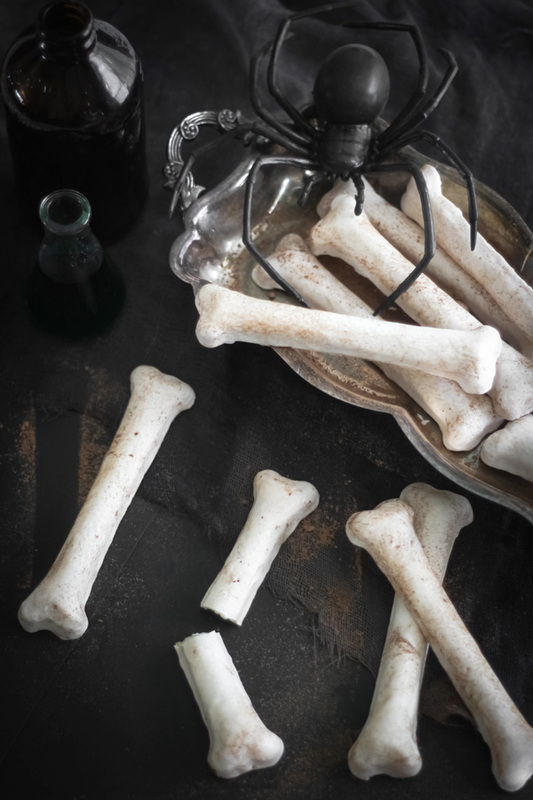 I suddenly have the urge to sing "Dem Bones" and then wish everyone BONE appetit! I don't think I need to tell you how much you NAILED the look of real bones! They look absolutely amazing. And the pictures! Everything is just perfect. Once again, another great treat. Love your creativity! These are so creative and fun, and I cannot believe how easy they are to make. Now I just have to find a bone pan! Aww, cute. Are they pug-friendly? ;-) Happy Halloween, my sweet!